Both of these are also nice: Josie 1, Josie 2. 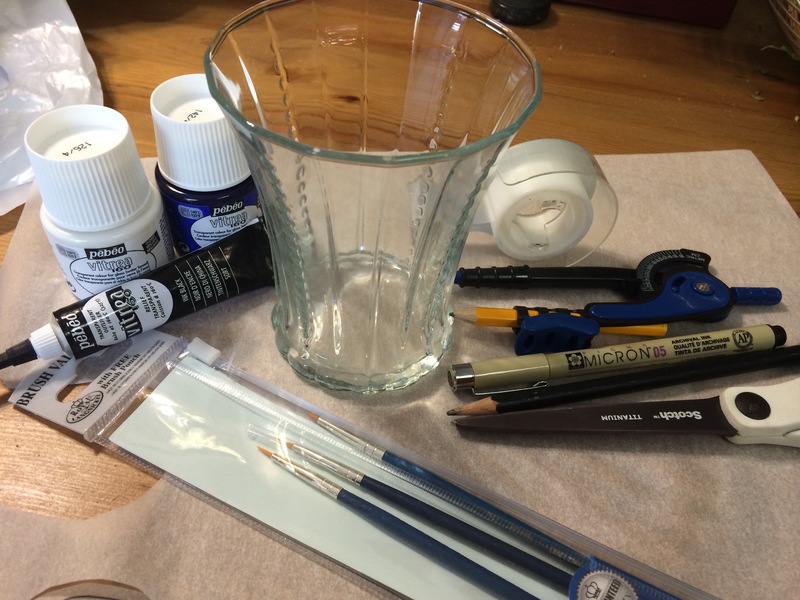 Since the last time I posted about glass painting, I’ve switched paint brands. I got a set of Martha Stewart multi-surface craft paints. They are much cheaper than Pebeo and I personally like the colors better (especially this gold!). I am sure they are not as high quality as Pebeo paints, and time will tell how well they hold up. 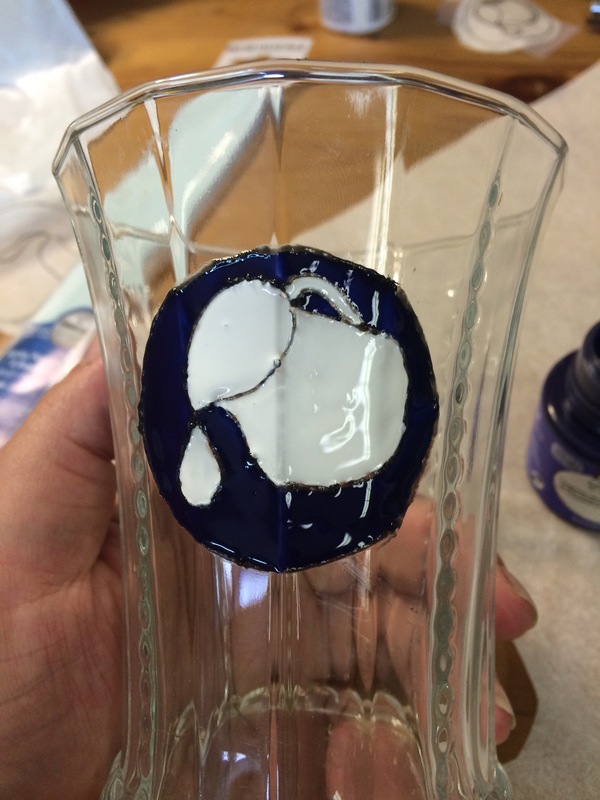 But they work very similarly in that you paint them on the glass, let them dry fully, and cure them in the oven. Notice that my paint is bubbly. I don’t know if that’s the paint or user error. Otherwise, the big breakthrough since the last time I posted about glass painting is switching to using more dots than lines. With my skill level and the gloppy consistency of the paint, this has been a much better way to yield something that looks decent. This particular design is inspired by some of the patterns on this Italian hanging lamp. I have started a board on Pinterest for examples of period painted glass — check it out. Unfortunately, most of the really beautiful figural paintings are utterly beyond me (at least for now! ), but there are a few examples on there with simpler geometric designs that I’m inspired to try out. 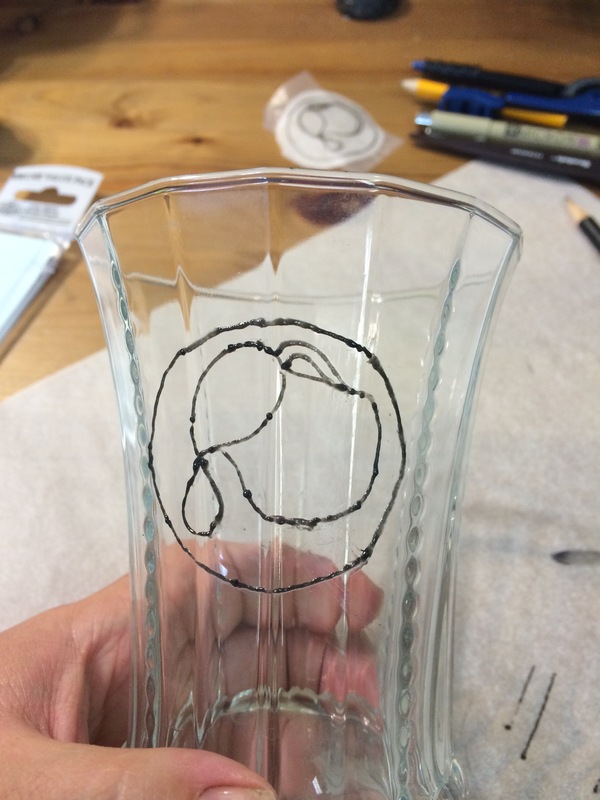 Here’s another relatively straightforward DIY project for you: a drinking glass based on Renaissance Venetian examples. Side note: I remember reading (where? when?) that these were made in Venice as an export or even something like a tourist souvenir. So even if you don’t have an Italian persona I do think it’s possible that you might have known of or even owned enameled glass. This project uses a modern craft supply, Pebeo Vitrea 160 paint. 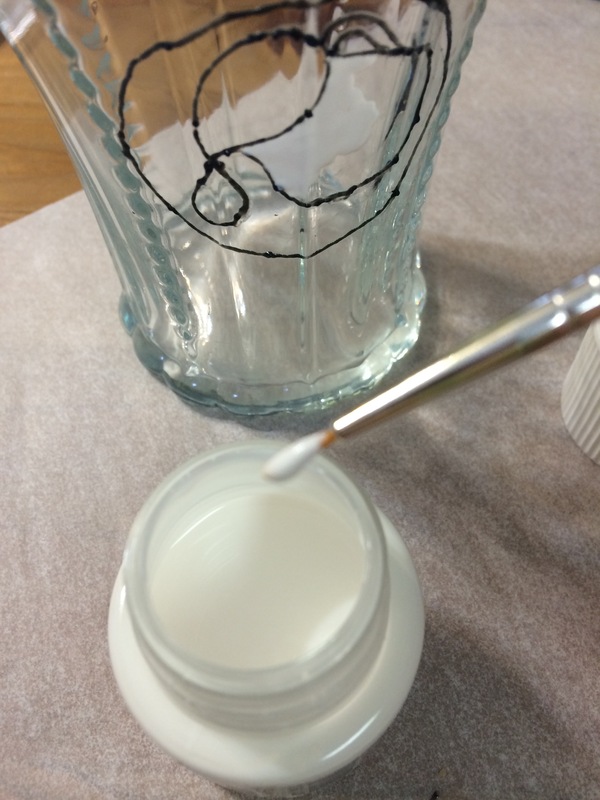 It can be painted on to glass and, after drying, can be baked to be made permanent. It’s easier to obtain and work with than actual historical enamel so it’s a good introduction for those just dabbling. I bought my paint at Blick Art Supplies for $6.99 per color. 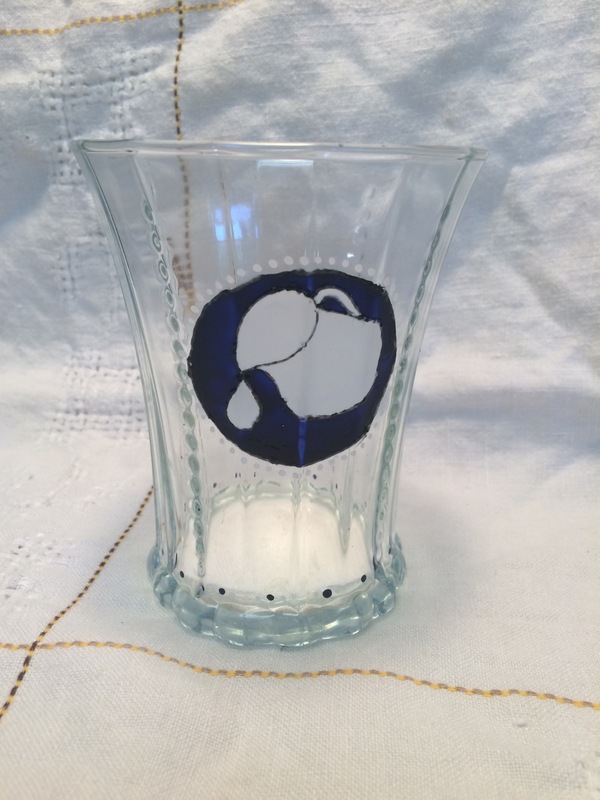 Until recently, one would have had to make do with just a regular modern glass tumbler for this project. But rather unexpectedly, the Pier 1 company apparently decided that everything old is new again and sells a particular style of tumbler that is, I’m assured, remarkably similar to 15th century Ventian glassware. Isn’t that nice of them? 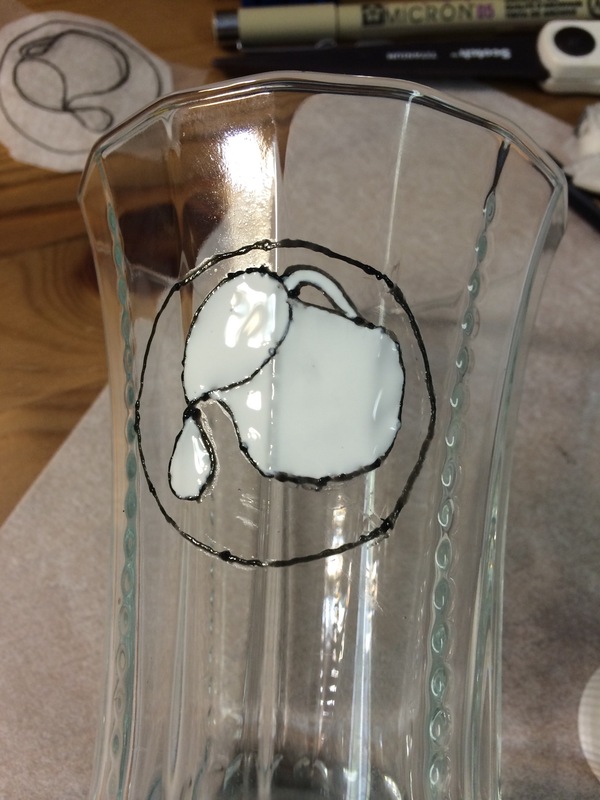 Because the paint is somewhat pricey and a little goes a long way, this project is well suited to making many cups with one motif. 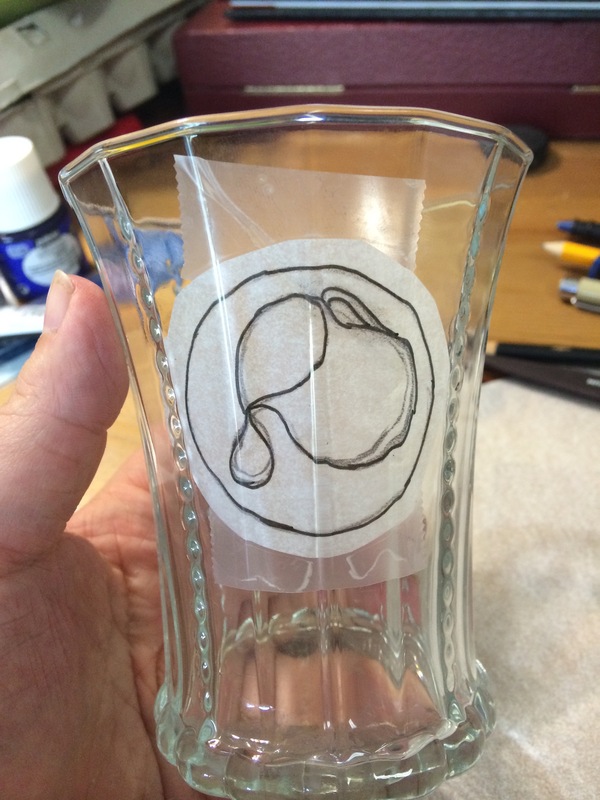 Here I am using my household’s badge, and plan to make more glasses just like this one. Now it’s easy to trace your design! The thicker Vitrea paint for outlining comes in 20 mL tubes. Blick did not have white, so I settled for black. 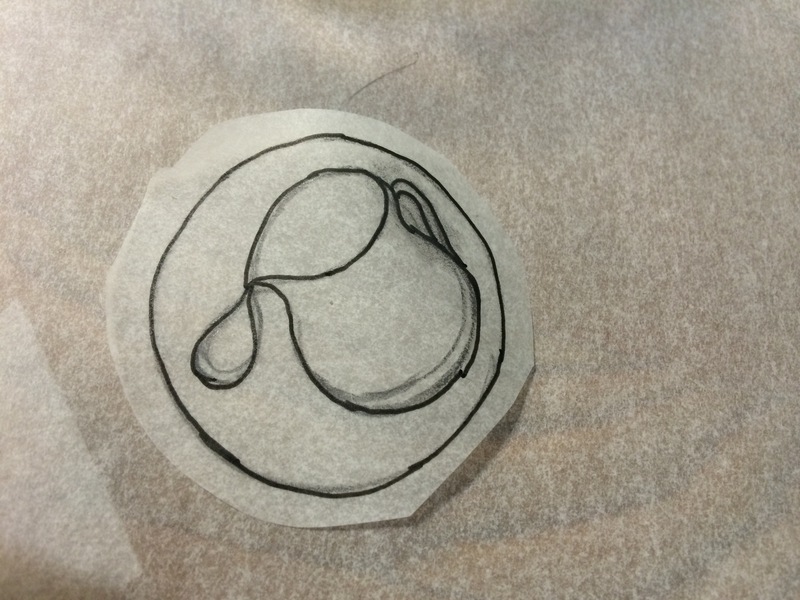 I found it was a pain to work with, and I practiced on my tracing paper to get a steady flow. Even with practice and wiping off then completely redoing the design (before baking you can remove the paints with a damp paper towel), the finished product was not as neat as I would have liked, but I decided it was passable for a first attempt. 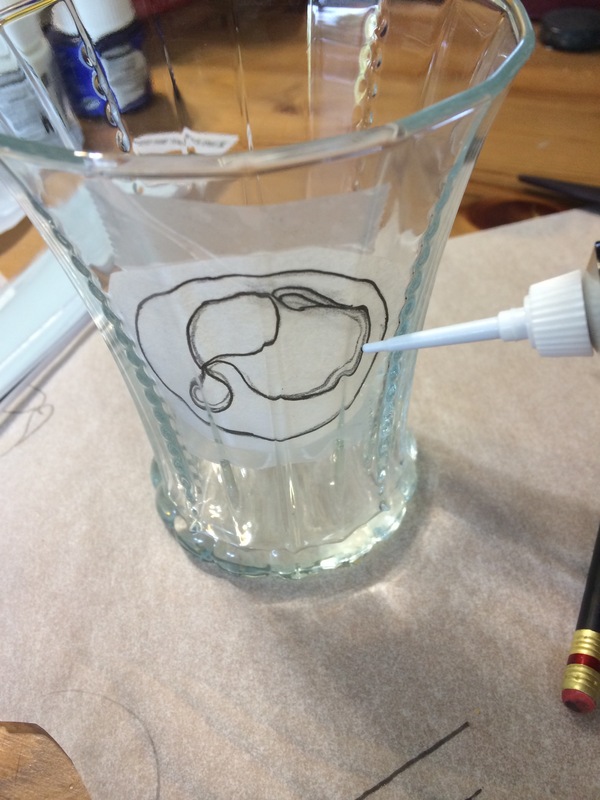 After removing the paper from inside the glass, you can start painting. For a translucent effect, you can dilute these paints with a thinner of the same brand. Since the original period reference looked fairly opaque, I skipped this step. Mix your paint well before starting and do one color at a time. (Again, this really lends itself to heraldry.) 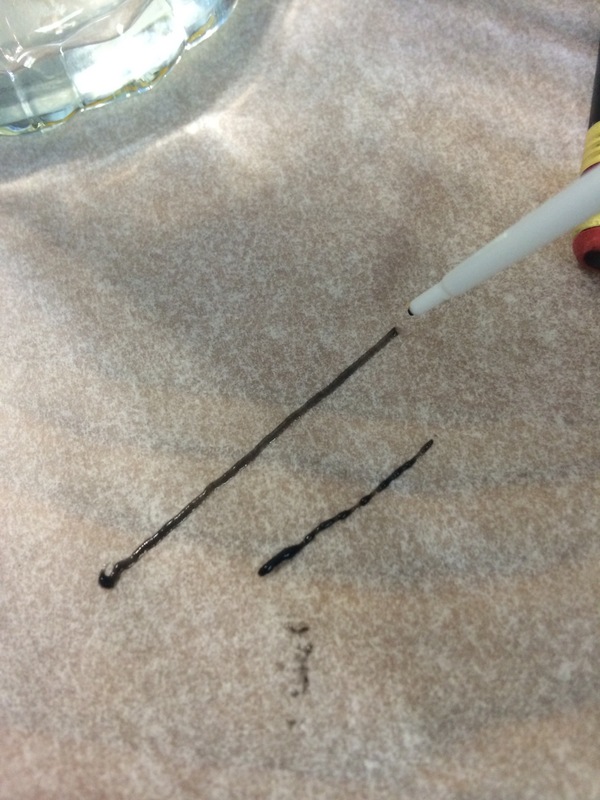 Use fairly small brushes and don’t mix media with your brushes. I just bought a cheap craft set of small rounds. I found it helpful to use more rather than less paint to get it to go on smoothly, and to work quickly so the entire area that I was working on stayed wet. Once the white was finished I washed my brush and did the blue. 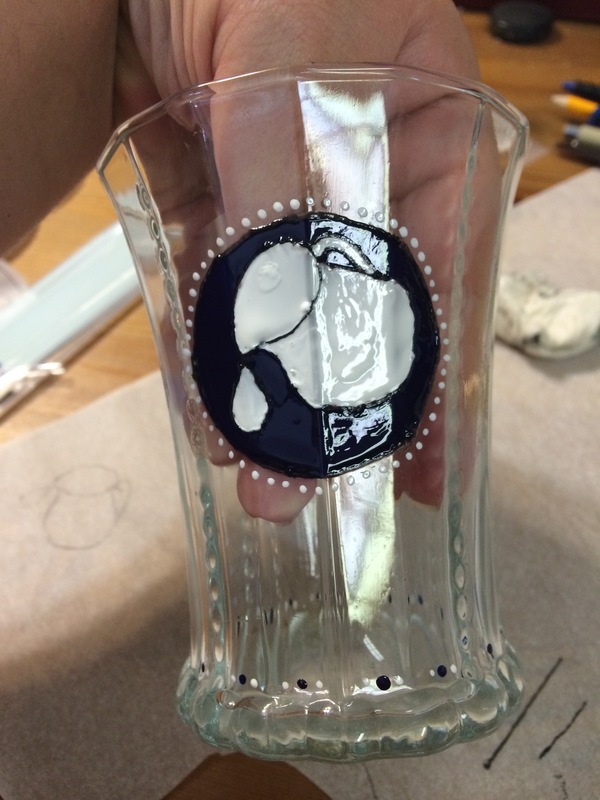 I then used the blue and white paints to make some very simple decorations around the rest of the glass. Obviously the original is much more intricate, so maybe that’s what I can aim for in the next version. Let dry for at least 24 hours, then bake in a 325F oven for 40 minutes.